The article further states, “The extra attention Mrs. Cline receives is the result of a radical departure from traditional fee-for-service medicine.” Well yes, I might concede that fee-for-service medicine has not utilized nurses effectively in the past. But a radical departure? Nurses have long been the patient advocates, case managers, health care coordinators and now care managers. The titles change but not nurses’ skills. The radical departure as far as I’m concerned is to recognize nurses cannot only make a difference improving patient outcomes but nurses’ interventions promote cost savings. Read the article for yourself. Granted, restructuring of our ailing health care system ignites strong opinions. But I for one can see that the nurses role in this restructured delivery model improves the quality of life for all enrollees. I am pleased to share this article from Reiki News Magazine ReikiInCancerCenter RNM 2 March 2012 written by Jane Van De Velde, DNP, R.N. Reiki is one example of the different skills nurses and nurse practitioners use in treating the whole patient: body, emotions, mind and spirit. Reiki is a complementary holistic healing practice, which creates many beneficial effects that include relaxation and feelings of peace, security and well-being. Marianna, I finally found time to read the NY Times article. And I was immediately transported back to our days in Home Based Primary Care at the VA. We always used an interdisciplinary team approach to caring for our frail elderly patients–most of whom had comorbidity as well as polypharmacy. Our nurse practitioners were the front line case managers and would bring in other team members as needed. 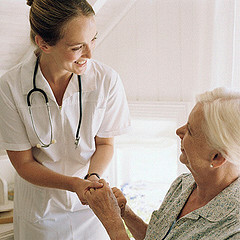 Our program was very successful in keeping people home, decreasing hospitalizations and contributing to quality of life. Nurses as well other team members can make a huge difference in helping to control healthcare costs while at the same time just taking good care of our patients. And thank you again, for sharing my article! Good point, Jane. The team effort does make a difference rather than one discipline, usually the physician, totally in charge.